No doubt if you’re a regular reader of ours or any other music related website you are aware that the second most iconic nightclub in UK if not Global clubbing history, the Hacienda being the first, has recently had its licence permanently revoked due to alleged drug related issues. This comes at a time where the number of nightclubs in the UK has already halved in the last 10 years, according to the Association of Licensed Multiple Retailers (ALMR), dropping from 3,144 in 2005 to just 1,733 in 2015. A figure that despite its stark implications, when published in 2015, went relatively unheeded. And like the iceberg that hit the Titanic, indicates that perhaps we should not be as surprised as we all are that Fabric has now also been struck. Want some answers to these questions or perhaps you have a few thoughts of your own that you’d like to share. 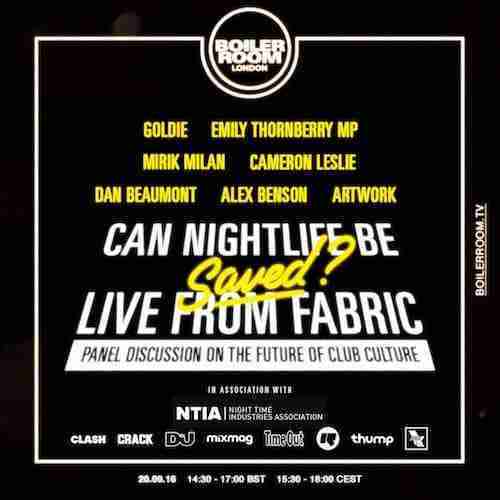 Well tomorrow (Sept 20th) is your chance at a special [LIVE] Boiler Room forum – ‘Can Nightlife Be Saved?‘. Fabric is hosting the event and joining them will be Emily Thornberry – MP for Islington South + Finsbury; Mirik Milan – Night Mayor of Amsterdam; outspoken artists and Fabric regulars – Goldie and Artwork; Alex Benson – Bloc; Dan Beaumont from Chapter 10, Dalston Superstore and (the now sadly shut) Dance Tunnel; and, naturally, Cameron Leslie, co-founder of Fabric. Weblink: Can Nightlife Be Saved?